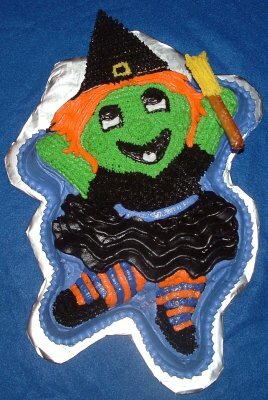 I made the witch cake using the Ballerina Bear cake pan from Wilton. When the leaves start changing colors, I know that Halloween is just around the corner. To help get the kids into the festive Halloween season I made a witch! I baked a chocolate cake from the box and cut off the access (at the bottom) so the cake would lay flat. Once the cake was all cooled I must admit I felt a little overwhelmed when it came to icing the cake. I first made the purple icing for around the outside of the witch (tip 47 and tip 3). I felt like I should start with something easy. Then I made little dots around the outside, again very simple. Next, I made my black icing (start by using chocolate icing and add a little black). I used tip 3 for the eyes and mouth, then I used tip 16 for the shirt and tip 16 for the shoes. I then put tip 16 onto my purple to make the belt. Next, I used tip 104 for the skirt. Tip 104 made a few more ruffles than the tip that was recommended. I used tip 3 for the whites of the eyes and then to finish the eyes I dipped my finger into a cornstarch and water mixture and tapped the eye with my finger. For the leggings I used orange and purple with tip14 (a small star shape). Then I moved onto the hair. The hair is orange and I used tip 18. I pulled and dragged the icing to make the hair. Then came the hat. I for some reason did not want to make sugar cookies just to finish the cake, so instead I cut a triangle shape out of cardboard. I put some icing on the witch and then stuck the cardboard to it (the icing acted like glue). Then I iced the ‘hat’ part. I looked fantastic when completed. For the broom, I had purchased an extra large pretzel. Again I stuck it on with icing and then iced the green skin color over the pretzel. I used tip 18 again for the straw on the broom. I pulled the icing along and a little about the pretzel. The cake looked fantastic!!! What a great way to get into the season by creating the witch cake out the ballerina bear.